Cannibal is a great, clean, primary red creme with a shiny finish. I have a LOT of reds, but surprisingly, not many basic reds. Cannibal's not too warm and not too cool either...it's a basic fire engine red...and I'm crazy about it. Which is ridiculous, I know. But I can't help it. This is two easy coats. Dusted starts out on the sheer side. It's a grape purple with an ultra-fine iridescent shimmer that SBL describes as seafoam. The really surprising thing about this polish is the finish. Without topcoat, it's slightly textured and semi-matte! That's how I'm showing it here after three coats. I tried to come up with some original and clever way to describe Weird Girl, but I can't do any better than Natalie herself. She describes Weird Girl as a "strange, yet flattering neutral...a light concrete grey, with gold/red/purple opalescence." It's oddly lavender in person. Greys don't have a "wow" factor in photographs, but this is very unique and I can actually wear it to work! My swatch is two coats. Plip is a darkened teal cream with sparse black glitter, similar to what we've seen in the Illamasqua Speckled line. The formula seemed thin, but coverage was really good and the polish stayed where you put it...not runny at all. My swatch is two coats with two top coats to make it smooth. And last, but not least, we have Blitz...a galaxy mani in a bottle. The base is a remarkably dense black crelly with multi-shaped and sized holographic silver glitters. I went easy on the first coat, keeping it thin and streaky. With polishes like this, laying down a fairly thin base coat gives subsequent coats something to stick to and you'll avoid polish dragging and finicky glitters. I had complete coverage in two coats. This was subtle indoors, but really blingy outside! I topcoated it twice for smoothness. So my faves are Cannibal and Blitz, but I'd recommend all five shades in this collection. 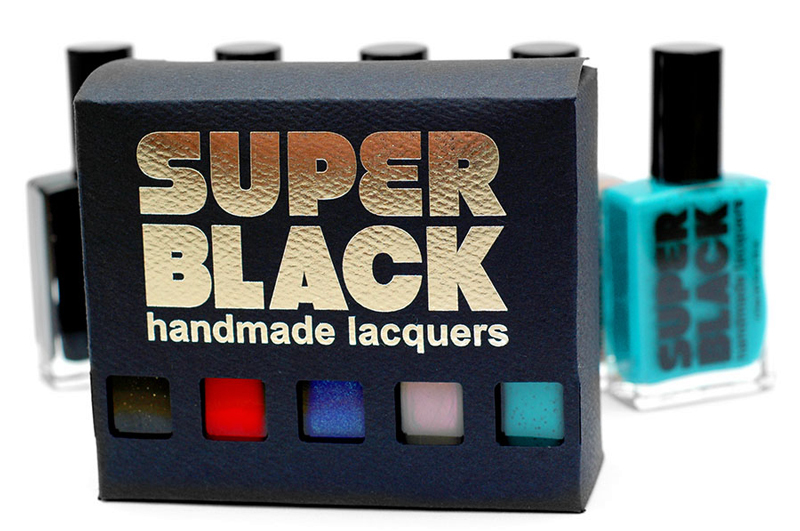 All Super Black Lacquers are 4-free. You can purchase them from the SBL online store for $12 for a huge 18ml bottle. Stay current on all things SBL by following Natalie on Facebook, Twitter and Tumblr too.